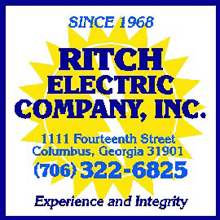 Ritch Electric has been in business 50 years, is located in Columbus, Georgia. Our biggest customer is Fort Benning, Georgia (DOD). Even though we are small we have broad capabilities. We are largely commercial and institutional construction.